There is great debate in our household about a certain topic. Well, it's more of a picture than a topic. 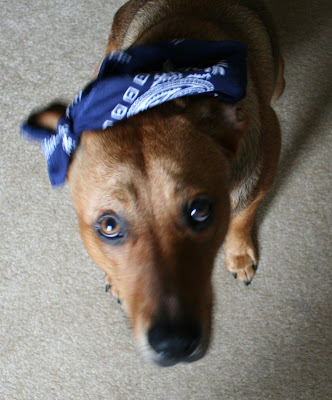 Jaco was running around wearing this bandanna a few days ago. I think he look like a tiny furry gang member. Matt things he looks like a sailor. I'd like to say it is only because we were snowed in this weekend, which is true, but the reality is that we have conversations like this on a regular basis. We're just THAT DEEP. So, I leave it to the experts, gang member? Sailor? Sailor? Gang member? I particularly like saying he looks like a 'thug-muffin' which may or may not be a word I completely made up, but try saying it! I mean, look at the contempt on his face! He's a total thug-muffin! *Spell check didn't highlight thug-muffin, that is just further proof that the English language is on a slippery slope! I think we all knew that after they added 'meh' to the dictionary though, didn't we? I'm casting my vote for tiny furry gang member. He's adorable! 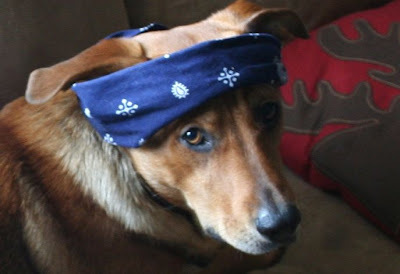 I think he looks like a hip-hopping member of a gang of retired sailors. Oh the indignity of it all! BTW, we are still snowed in - snow now up to the door lintel so that we can hardly open the door to get out! Oh man... he's totally gangsta! I don't even SEE sailor. I see totally gang. 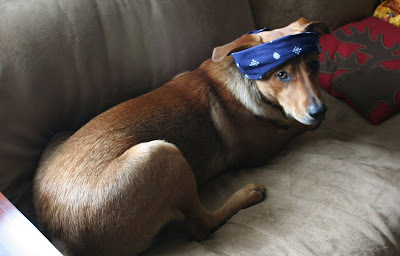 He rocks the Tupac! That's straight up gang member! Gang members wear them in a band - O-shaped. Pirate wear them like a hat - they cover the top of the head too. A total and complete Thug-Muffin. LOVE IT!! Oh sweetie, you have a pimpin' gangsta on your hands. Watch out for his posse! Gang member for sure. But hes cute anyway! Thug muffin? Awesome! And there is no way he's a sailor girl. Gangsta' all the way! He's DEFINITELY an (adorable) little thug!! or homeless maybe?? JK! Def gang related apparel!